A Box in folding, A Canoe in unfolding! MYCANOE is a patented, award winning, TUV certified, origami concept folding canoe. You can fold and unfold MYCANOE in less than 10 minutes and enjoy anywhere. MyCanoe easily folds up into an easy to carry box. So the boat will be ready for adventure when you are. Store the boat in the boot of your car, in the back of your van or inside your motorhome, caravan, or campervan. Or store inside your home and take with you on the bus, train or plane. Or possibly you need an open style canoe that is easy to pick up, and is definitely better or more realistic than an inflatable canoe? With only a few separate parts to put together, the MyCanoe / MyDinghy will be ready in less than ten minutes with practice. Initially, the assemblies takes longer as the boat is new and and the folds needs folding and you are on an easy learning curve. Folding back into the box is quicker - there is no need to learn the art of origami, the boat will fold into itself. 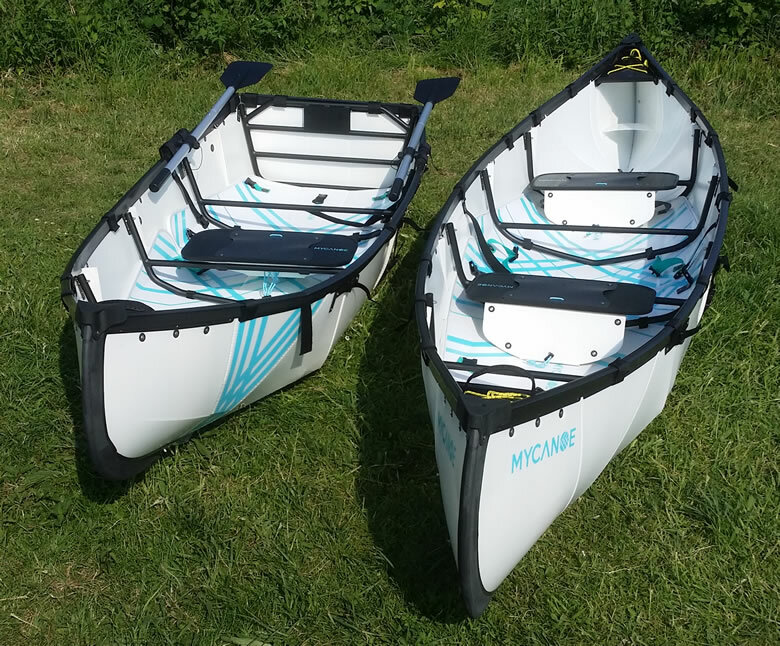 The main shell of the MyCanoe and MyDinghy is made from a single piece of custom high quality polypropylene with a 15 year UV treatment that is rated 20,000 folds! Will you use the boat up to 20,000 times? Quality 14 ft MyCanoe in 10 minutes to assemble and 5 minutes to fold it back to 37 x 25 in box. Quality 9 ft MyDinghy also has the same assembly time and folds into a similar sized box. Award winning, TUV certified, better or comparable with traditional canoes. Optional stabilizer, oar lock kit, and motor for fishing and other activities. Ability to adjust the degree of keel rocker as required. A Box in folding, A Dingy in unfolding!